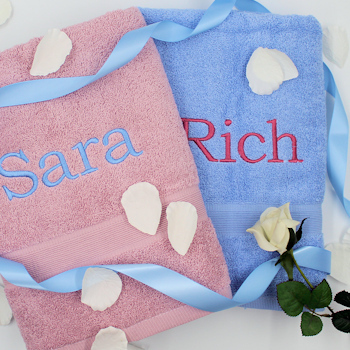 Personalised bath towels a unique gift in dusky pink and blue. Personalised bath towels a unique gift in dusky pink and blue. Popular for wedding or anniversary gifts and even a great housewarming gift. This set of contrasting colour bath towels are soft cotton and measure 75x125cm.